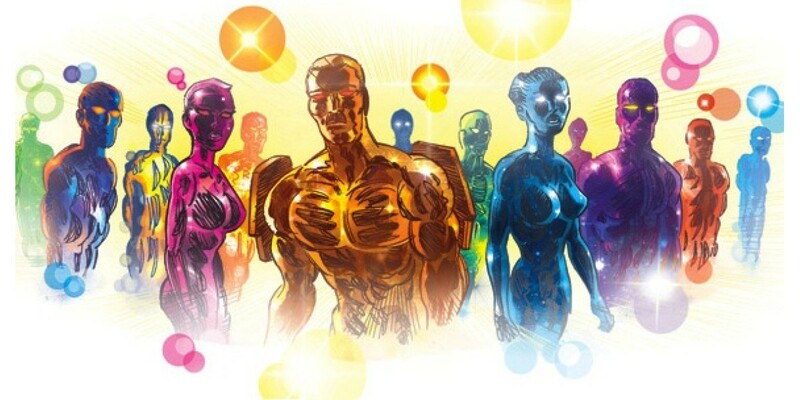 Image Comics' Greatest Cosmic Superhero Epic to End with Galactic-Sized FINALE Issue! GØDLAND, the long-running Image Comics series that launched in 2005, comes to its long-awaited end in the GØDLAND FINALE, a 72-page one-shot to be released in November. Man of Action Studios' Joe Casey and artist Tom Scioli have created an epilogue story that takes the cosmic grandeur of the Eisner-nominated series to incredible new heights. It's been more than a year since the last issue, #36, was released, but Casey and Scioli will address the passage of time in a much more dramatic way. "In the FINALE, we jump one hundred years ahead into the future," said Casey, "and show a world significantly transformed by Adam Archer's 'GØD-like' actions as seen in issue #36. But, once again, humanity is teetering on another major evolutionary brink... and what ultimately occurs in the final pages is the true culmination of everything this book has been about from the very first issue." For both Casey and Scioli, this issue is much more than simply bringing the story to its mind-bending conclusion. It's about carrying on the tradition of experimentation that has been a hallmark of the series since its debut. "In some ways, this is an attempt to take comics to another level, rethinking the ways that a story can be delivered in comic book form," said Casey. "We've got one last shot to make a glorious, significant artistic statement here, and we're going for it in a big way! There'll be new characters, new conflicts and new cosmic enlightenment — all in a single issue!" Tom Scioli adds, "GØDLAND #36 and the FINALE are our Hunger Dogs, our Mister Miracle #18, our Silver Star #6. I feel genuinely privileged that we were able to end the comic properly, something very few series get to do." With the FINALE finally set for release, Casey and Scioli are feeling the weight of bringing to a close a series that has been part of their lives for the last eight years. Reminiscing on the overall experience comes with the territory. "With GØDLAND I learned that you can be funny and still be serious," said Scioli. "For as bloated and excessive a prog rock comic GØDLAND is, I learned how to tell a story economically from it. We cover a lot of ground in those 37 issues. I had to draw seven different versions of the future, which is the biggest challenge I've ever faced in comics. I didn't know I had that many in me. Most cartoonists only have one or two in them." On their creative collaboration, Casey said, "Tom can draw everything, and more importantly, he doesn't shy away from drawing anything. If you're gonna do a bona fide cosmic superhero epic, he's the guy you want drawing it. And there are sections of the FINALE that are as jaw-dropping as anything you've ever seen in a comic book before...!" On working on the book, Scioli added, "I learned that there's more to life than Jack Kirby. Joe brought his influences to the project and I sought them out to see for myself. Cosmic jokesters like Starlin, Gerber and Englehart, among others. These creators have since become favorites of mine. Most of all, I learned how to collaborate. I couldn't ask for a better creative partner than Joe Casey. What we created together is very special to me. I'm eternally grateful to the people who supported us and our book."